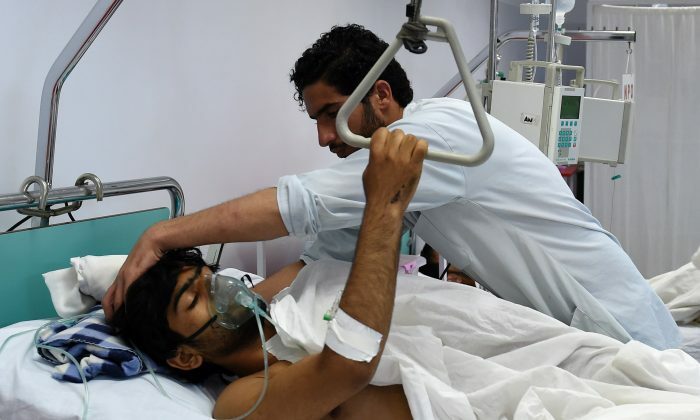 When a U.S. gunship shelled an Afghan hospital last fall, reducing it to rubble, it wasn’t a war crime nor negligence, according to Pentagon investigation released April 29. On October 3, 2015, a U.S. Air Force AC-130 gunship attacked near a hospital in Kunduz, Afghanistan, run by Doctors Without Borders (MSF), killing 42 people, including 14 staff members. General Joseph Votel, the commander of the U.S. Central Command, talked to media on April 29 about what went wrong. U.S. and Afghan special forces were engaged in intense combat for a few days in Kunduz when the U.S. soldiers called for a self-defense air strike on the insurgents’ location. Because of that call, the AC-130 took off 69 minutes earlier than planned and wasn’t able to receive all intended information, including “identification of no-strike areas.” The hospital was one of such no-strike areas. They couldn’t receive the information during flight, because one of their satellite radios failed. Votel said he wasn’t aware such failure would be a systemic problem. When the aircraft reached the location, it was intercepted by a surface-air missile, which, Votel said, was unusual in Afghanistan. It then moved several miles off the city center. They then received the coordinates of the target, but when they entered them into their system, the coordinates led to an open field—not their target. They then attempted to find the correct location, based on description of the building they received from the ground forces. They found the hospital instead, because it “generally matched the physical description,” Votel said. The hospital was about 400m (437 yards) off the actual target. There was no gunfire or fighting in or around the building, but Votel said it is not unusual for the aircrew to not be able to visually confirm fighting on the ground for their targets. The gunship started to fire, with all they had, and continued to do so for about 30 minutes. Meanwhile, ground troops received information that a MSF hospital is under an airstrike, but they didn’t immediately recognized that it was their airstrike hitting the hospital. When they finally did, they ordered the airstrike to stop. Votel said everybody involved tried to “do the right thing,” but acknowledged there was a lack of communication between the air crew and the ground forces. Votel said 16 military personnel were disciplined, including the ground force commander and three officers in the aircraft. No names were released to protect their privacy and, in some cases, because they are still assigned to sensitive or overseas positions. Some were given letters of reprimand and admonishment; one officer was removed from command; some were suspended from their duties and some were given extensive retraining. No one was sent to court-martial. “It is important to point out that these adverse administrative actions can carry severe repercussions on the careers and professional qualification of these individuals,” Votel said. Votel said certain personnel failed to comply with the rules of engagement and the law of armed conflict, but because there was no intention to commit a crime, the incident can’t be classified as a war crime. And because none of the personnel intentionally tried to “take any shortcut” or to “violate any rules,” there was no negligence. Meinie Nicolai, president of MSF, took issue with Votel’s assertion. Votel expressed “deepest condolences” to those injured and to the families of those killed. He said compensation was paid to victims’ families—$3,000 to wounded and $6,000 to families of the dead. Central Command released a redacted version of the full investigation report on Friday.